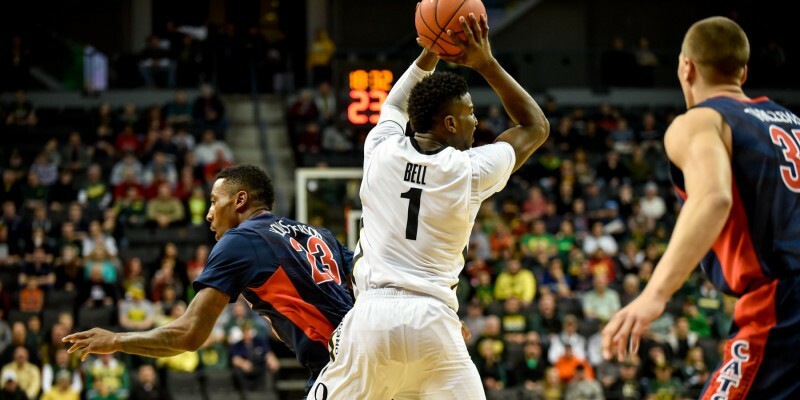 Dana Altman and the Oregon Ducks men’s basketball team will battle Sean Miller and the Arizona Wildcats tonight in Tucson, AZ. It’s been nearly three weeks since these two teams last met, and while one team is poised to make a national championship run, the other is still trying to figure things out. The Ducks currently sit in the fifth seed of the Pac-12 standings, and despite the fact they’re in the middle of the pack, it’s definitely a lot better than what most people expected. On the flip side, the Wildcats are the best team in the Pac-12 and one of the best teams in the nation. Miller’s club is currently ranked sixth in the AP Poll. There’s no doubt Oregon will have a tough time tonight, especially when you consider the fact that the Wildcats have won 32 straight home games. In Oregon’s last meeting against Arizona at Matthew Knight Arena, nothing went well for the men in green and yellow. The Ducks had an incredibly hard time shooting the ball, as they only connected on 35% of their shots. Arizona’s stifling defense hounded Oregon’s guards all night and that made it difficult for the Ducks to generate easy looks. Also, the Ducks were out-rebounded by 13 and their leading scorer, Joseph Young, shot a measly 4-15 from the field; however, that’s in the rear-view mirror now. If the Ducks hope to have any success against the Wildcats, it will start offensively. Oregon scored 82 points and shot 62% from the field in its victory over the UCLA Bruins last Saturday. While it may be difficult to duplicate that type of shooting, especially against a much tougher defense, Oregon’s offense will need to produce tonight. The Ducks can’t afford to get off to a slow start offensively because they can’t consistently rely on their defense to keep them in games. The Wildcats raced out to an early 12-2 lead when they played the Ducks in Eugene nearly three weeks ago. If that happens again, Oregon might not have a chance tonight. While the offensive end will be very important for the Ducks, they still have to play defense. The Wildcats’ starting five scored 69 points when Oregon and Arizona last played, and their starters, which include T.J. McConnell, Kaleb Tarczewski, Rondae Hollis-Jefferson, Brandon Ashley and Stanley Johnson, shot a combined 54% from the field, as well. While the Ducks aren’t known for their defense, they will have to show up with some intensity tonight. These young Ducks are still trying to figure out who they are. It’s still a work in progress. Oregon will have to bring its “A” game tonight.